It’s easy! There’s no need to stress if you follow these steps. Three Easy Steps to Book your Trip to Watermill Fishing Lodge.. Check the date of your passport or ID. Be careful for the luggage limit, keep in mind we rent fishing gear. Collection to the airport organised by ourselves. Be careful! Drive on the left! Essential items for a dream getaway. 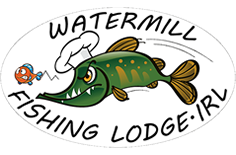 Please take your time to carefully pack your items to ensure you get the most out of your experience at Watermill Fishing Lodge. We’re here to help for any queries, get in contact with us. To ensure your comfort we suggest you wear a layers of clothing as the weather in Ireland can change very, very fast. It’s not uncommon to see the four seasons in one day. Cotton undershirts with long sleeves and under thermals will keep you warm, as well as a good quality waterproof coat to keep you dry. We also have extra rain jackets in case you forgot your own. You are very welcome to bring you favourite fishing equipment, however be very careful with what you can bring on the plane. Over carrying the weight limit can be very expensive and some items may be deemed too dangerous to bring on board. Keep in mind that we have fishing gear for rent except for lures and trace. A lot of fishermen bring far too many lures, we advise your 25 favourites. We are also very happy to advise you before the departure of the best moment lure, or what equipment to loan. Consider your camera essential to capture the memories of beautiful scenery, exciting wildlife, and of course the biggest trophy fish you can catch! Don’t forget to check again for any medicines you may require to bring and any toiletries you may want. Double check the validity of your Passport or chosen ID, and make sure it stays valid when you want to return! Even if we are in Ireland, bring your sun cream and sunglasses! Watermill Fishing Lodge is always protected by our microclimate! No matter how cold it is outside, it’s always warm and friendly inside. Ireland is very well known for its temperamental weather, temperature can drop 20C and wind can become gale force in a matter of minutes. So always be prepared for the worst, even if the sun is glowing when you start your fishing.